The Emergency Transport Program is the fastest way to get the sickest kids to the best children’s hospital on the West Coast. Rotors chop the air, a shadow passes overhead, and everyone within earshot pauses for a moment. Staff know that when a helicopter lands at Children’s Hospital Los Angeles, there’s a child inside who could only get to the hospital in time by a ride through the clouds with the Emergency Transport team. 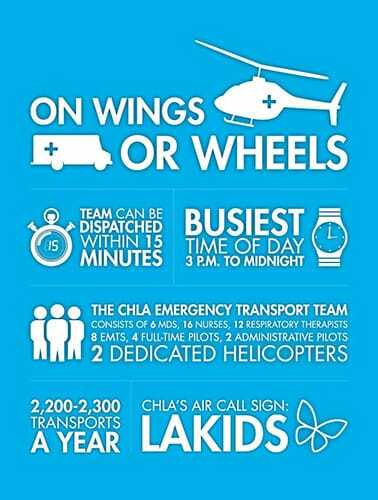 Few of the hospital’s services announce their arrival quite like the Emergency Transport Program -- with the rush of two turbine engines by air, or flashing lights and wailing sirens on land. The program, which launched at Children’s Hospital in the late 1980s, transports between 2,200 and 2,300 patients a year, from as far as Guam and as close as CHLA’s next-door neighbor hospitals. When a call comes in, the helicopter is on the hospital’s roof within 15 minutes to load up the Transport team, and then heads swiftly off to pick up its precious cargo. Geri Gregorczyk, RN, often remembers details from specific flights -- impressive, since she estimates she’s been on well over 700 in her 23 years as a nurse with the program. Her experience has given her a philosophy about what to expect in the field. Though the caseload is a mix, about half of the transports the team makes are for neonatal cases. During the winter, the cases skew more toward respiratory illnesses; in the summer, injuries spike. The Emergency Transport team is a tight-knit group. That’s not surprising, since team members often work together in a space about the size of a regulation pool table. In those conditions, staff have to be able to work well together -- something this team prides itself on. Depending on the needs of the patient, a team may consist of a nurse, a respiratory therapist, an emergency medical technician (also the driver for ground transports) and a physician. Their day starts at 7:30 a.m. with a threeway call between Emergency Transport, the pilot at Helinet Aviation and the hospital’s Access and Transfer Center, which initiates most requests for transport. Helinet reports on the weather, the current condition of the helicopters and which pilots will be on duty. The Transport team and the Access and Transfer Center share the list of staff on duty and any transports that may be pending. Helinet Aviation provides the hospital’s helicopter services, including one Sikorsky S-76B, one Sikorsky S-76A and six experienced pilots (four full-time and two backups). Helinet’s owner and president, Alan Purwin, serves on the Children’s Hospital Los Angeles Board of Trustees and donates the helicopters, pilots and maintenance to the hospital, free of charge. The pilots use a different vernacular -- tossing out terms like “bag of fuel” (a tank) and “milk run” (one of their often-traveled routes) -- but downplay their own importance on the team. “We’re just the guys up front,” says Brad Jensen, chief pilot at Helinet. He worked as a full-time pilot for the Emergency Transport team from 2004 to 2008 and still considers CHLA his “baby,” flying for the team seven or eight times a month. The pilots are given as little information about the patient as possible -- only name and weight, the basic facts needed to ensure a safe ride. “If the crew is safe, the kid is safe,” says Jensen. He doesn’t want a pilot’s judgment about the safety of flight conditions clouded by an emotional response to a patient’s situation. “It’s rewarding, but I’m just carrying the people who are doing all the work,” says Colin Chaney, one of the team’s full-time pilots. Extreme weather conditions like wind and low visibility can keep the helicopter grounded, but extreme heat is also a problem. Since hot air is less dense than cold air, it is harder for the helicopter to lift off in warmer conditions. The pilots have to adjust for this by reducing the weight on board (which can even mean bringing less staff and equipment). Elysia Weiner, RN, has experienced firsthand the importance of an emergency transport program. A nurse in the Cardiovascular Acute Care Unit at Children’s Hospital Los Angeles, she was working on CHLA’s 6 West unit in 2006 when her 4-month-old son, Ben Berger, was diagnosed with one of the very diseases cared for on her unit. “It was like an out-of-body experience,” she says. It’s a relatively rare disease, and Ben’s pediatrician was never able to find anything wrong on the visits prompted by Weiner’s instincts as a mother and nurse. Finally, an echocardiogram confirmed her fears: severe pulmonary hypertension. Ben’s doctors called for a transport to Children’s Hospital Los Angeles immediately. “When I saw Geri and the respiratory therapist walk into the hospital, it was a huge comfort,” says Weiner. 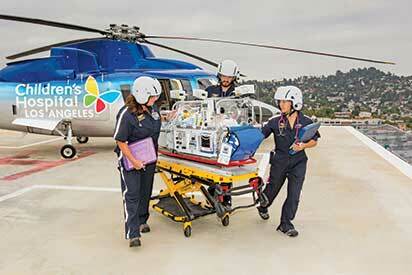 Ben was transported and admitted to the Pediatric Intensive Care Unit at CHLA. The team does its best to bring a parent along for the ride, if there’s space. Though Weiner would usually say “no thanks” to a helicopter ride, she didn’t hesitate to jump in when Ben was being airlifted. Shorter distances are covered by ground in the team’s ambulances, which are also used when the helicopters are grounded because of weather conditions. For longer flights, the team charters a Learjet. The program often makes trips to Guam or Hawaii, and has even been as far as Finland. “We’re extending the arms of Children’s Hospital out into the field,” says Calvin Lowe, MD, the program’s medical director since 1997. “We’re giving kids the best chance of survival, the best care.” The team has its own unofficial motto: “So that children may live.” It’s yet another example of the pride they feel about the work that they do. View the digital version rom your desktop, tablet or smartphone, or download to read this issue at a later time. If you Live L.A., Give L.A. Every dollar of your gift will help provide world-class care for every child that comes through our doors. Visit CHLA.org/GiveLA.